Bits or pieces? : A necessary capability but an unnecessary role - CDO. A necessary capability but an unnecessary role - CDO. Any widespread examination of corporate strategy will quickly demonstrate the prevalence of backward causality and the copying of others. 67% of companies have an "enterprise mobility strategy" ... do you? If this wasn't the case, my strategy template wouldn't have touched so many nerves. Depressingly less than 30% of large companies have any form of scenario planning and of those less than 4% have any formal means of situational awareness. The majority are playing chess without looking at the board which is why techniques like SWOT or Business Model Canvas or single size debates like Agile vs Six Sigma become rampant. This is why it's so easy for someone like me to walk into an industry and help myself - I'm no genius, I just understand that looking at the board (even an imperfect representation) in a game of chess is actually a sensible thing to do. 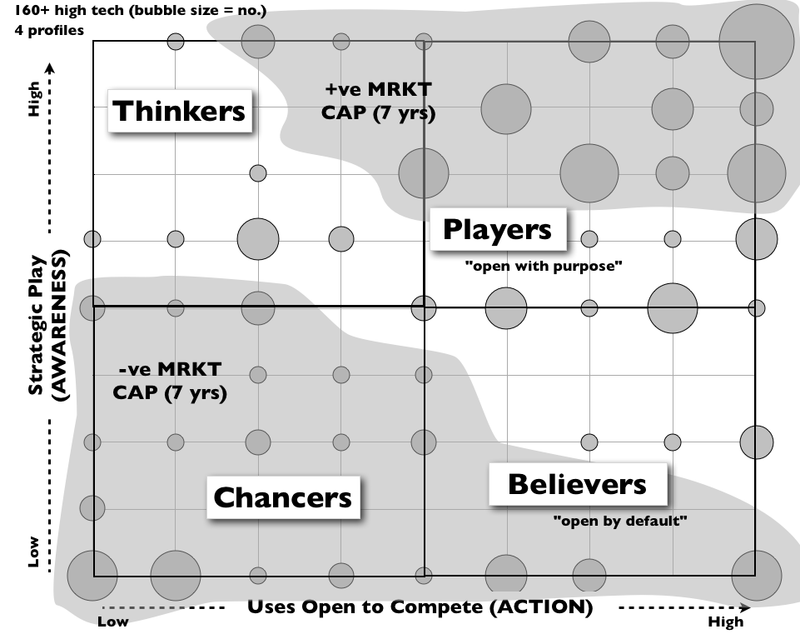 By understanding the basics of competition, we know that organisations evolve and a new phenotype appears. We know how (competition), we know the causes (co-evolution plus punctuated equilibrium plus inertia), we understand the cycle and it is even predictable, testable and this has happened. I can even give you a list of the modern phenotype (from 2011) - see figure 1. We can trace the process back through hundreds of years of history from the Web 2.0 to Fordism to the American System. We know that strategic play is not uniform between companies, even in the high tech sector. We know the economic impact of poor situational awareness - see figure 2. We know our organisations have difficult coping with change, we normally bolt on new roles and new departments to cope with the change. But this is not a sensible course of action but instead a symptom of a non adaptive structure - we bolt on because we cannot simply absorb the change. Given however that few can see the landscape and predictable changes heading towards them, this is probably no surprise. However, be under no illusions that improving situational awareness and creating adaptive structures is complex, it's not simple, it doesn't fit into a neat 2 x 2. Inherently a map is more complex than a SWOT. So, yes we are undergoing changes, many of which are predictable and we need to adapt. 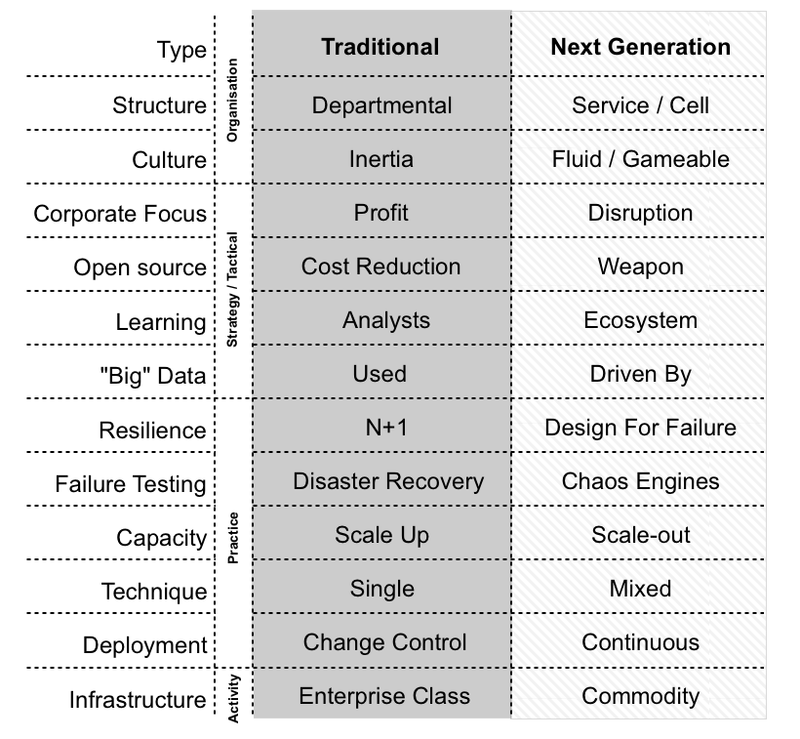 Since our organisations are not designed to do this, we've often bundled those phenotypic changes into roles - we hear the clarion call for Chief Insight Officers, Chief Data Officers, Chief Ecosystem Officers, Chief Digital Officers, Chief Open Source Officers, Chief Disruption Officers and on and on and on. It should be no surprise that the justification given is usually because "others are doing this" - backward causality and the search for simple answers remains as strong as ever. The words of wisdom I will leave you with belong to Phil Rosenzweig. Ah, the merry go round continues. All hail the new priesthood. Today's version appears to be the Chief Digital Officer. Tomorrow's will be something else. One day business will learn the lessons of the military from two thousand years ago and start to understand the landscape we compete in. Until such time, expect tomorrow endless calls for "Chief Ecosystem Officers, well HBR's got an article and 67% of other companies are hiring one" etc etc etc. Learn the capabilities, they should be absorbed. Try to avoid building structures you're going to simply dismantle later on. The capabilities of a Chief Digital Officer are needed, as for the role itself - well, maybe as a transitional structure to force change in an organisation that is unwilling or maybe there's a specific need (assuming you know what you're doing). In all likeihood most will be hired because 'other companies are hiring one'. Just remember it is the capability not the role that is important.